In 1898, a group of Finnish-minded businessmen established Finnish Business College in order to offer higher business education in Finnish. Today, after a merger took place in 2009, Suomen Liikemiesten Kauppaopisto – Helsinki Business College with over 2000 students is the leading and largest business college in Finland. 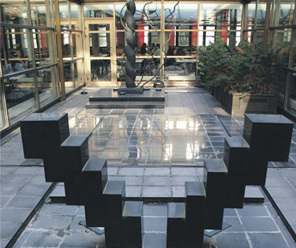 The college shares premises and co-operates with Haaga-Helia University of Applied Sciences. The purpose of the foundation is to support and promote the education at the college. 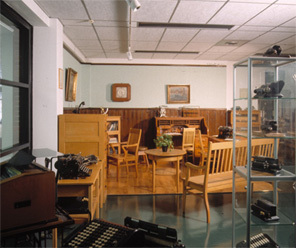 The foundation also maintains and develops the typewriter and calculator collection. In commemoration of the 150th anniversary of Finnish business education in 1988, The Foundation of the Finnish Business College decided to open a private museum collection of typewriters and calculators. Mr. Gennaro Di Napoli, a native Italian who has lived and worked in Finland for about forty years as, donated a basic collection of typewriters to the college. We show the typewriters and calculators in the condition “as found”. A question often asked is the value of the machines. There are no guides stating the value like with stamps. The value of most antique typewriters depends on the rarity, condition and the market demand. Most people overvalue an old and unusual looking typewriter. Mr. Raimo Harlio, president of the college 1982-1998, on whose initiative the museum was founded. With over 300 typewriters and about 150 calculators as well as office equipment our collection is the leading one in Finland. With few exceptions all the typewriters have been found in Finland. Typewriters from the 19th century are hard to find in Finland. There were only few companies using typewriters at that time. Most of the calculators and the Billnäs office furniture were donated to our museum by a Finnish company. The collection is exhibited at the premises of the college at what is called the historical section. Nearly five thousand students use daily the premises. 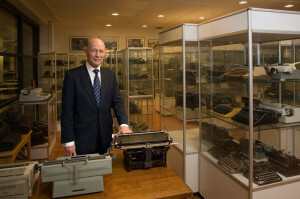 Our web-site is intended for a layman and business students and concentrates on the history of typewriter companies. The technical information about typewriters and calculators can be found in numerous web-sites describing the variety of typewriters and calculators produced in different countries. the college is only a five-minute trip away from downtown Helsinki by train. By contacting us in advance a visit to our museum can be arranged.